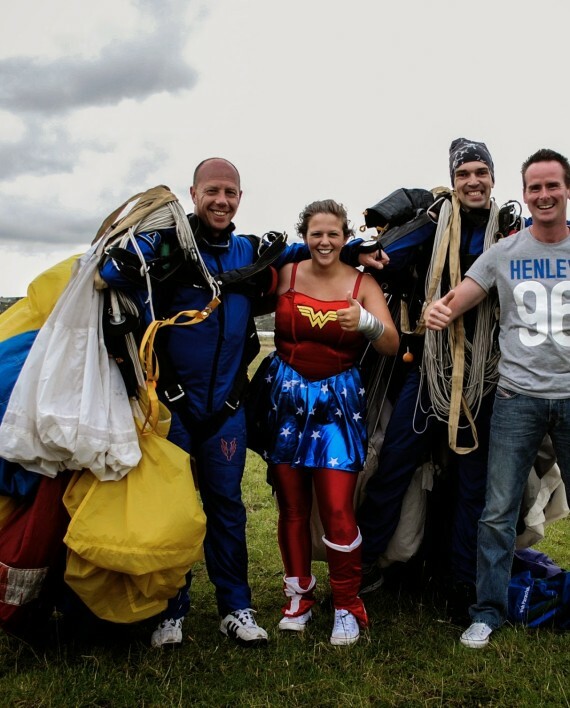 Enjoy the thrill of free fall from 10,000 feet at a speed of 200 km per hour! over the most stunning of scenery on a parachute made for two. 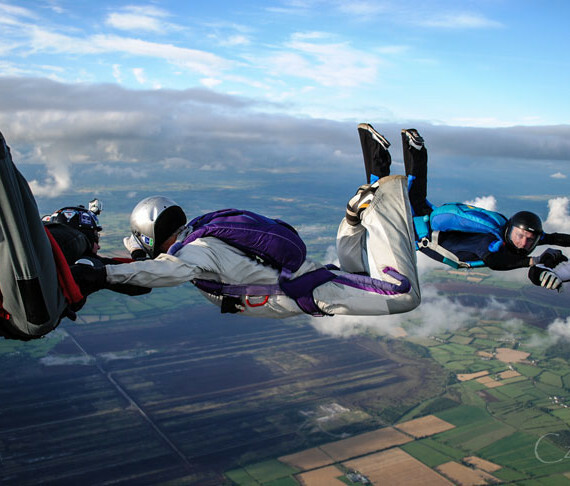 The skydive and training only takes 20-30 minutes. 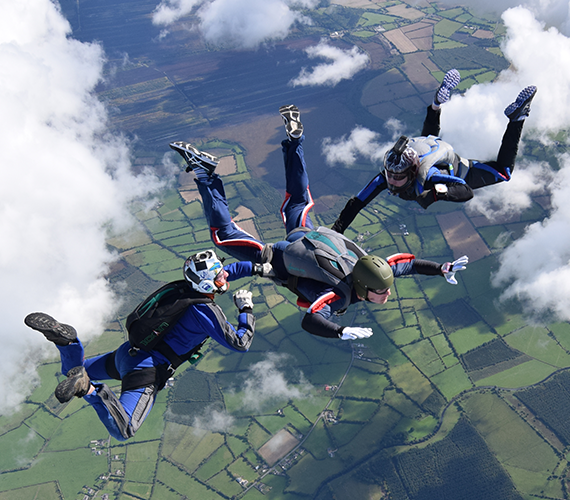 Your assigned tandem master – if it’s your first jump – will brief you on all phases of your jump and ensure that you get the most from the experience while taking every precaution to ensure safety. Cost of training and first jump: €199.00. 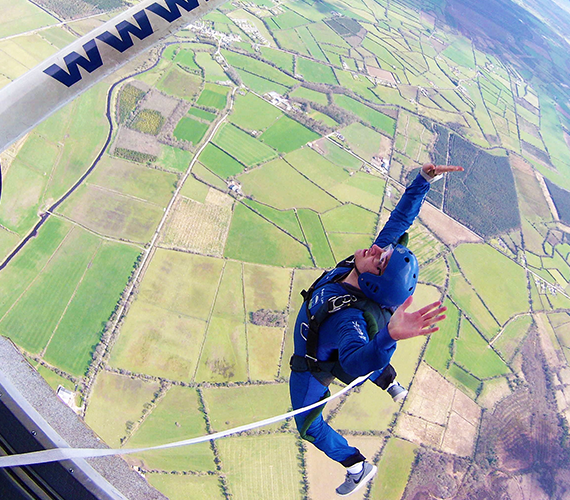 Every jump there after: €42.50 includes gear hire. Once you have completed your ground school training you don’t need to book in through the office again, you can just arrive down with your log card and put your name down on the waiting list. Assisted Free Fall ‘AFF’ Level 1. You are assigned objectives on this level. 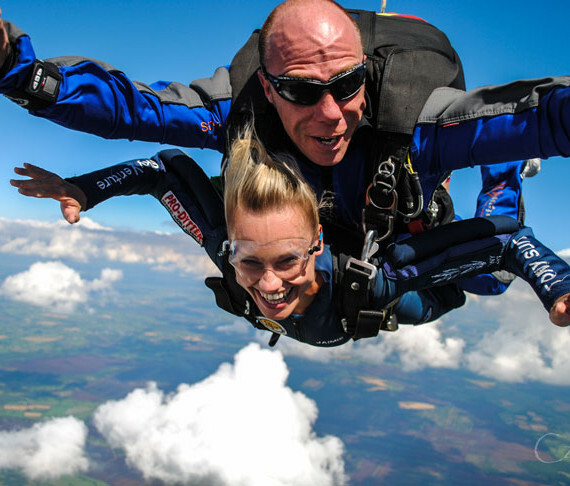 Two instructors will take you on your first level to 13,000 feet. On exiting the aircraft they hold onto you in free fall giving you hand signals based on their assessment of your body position. If satisfactory you may be released by the instructor who will continue to stay by your side. 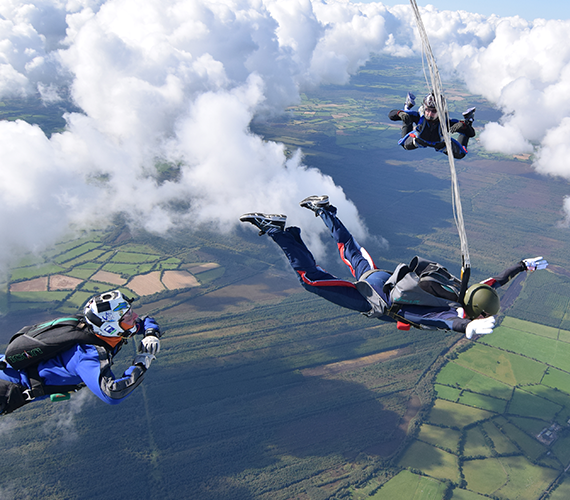 The remaining four levels will be with one instructor, only if you have demonstrated the ability to open your own parachute at the correct level. Assisted Free Fall ‘AFF’ Level 1 To 7. You are assigned objectives on each level. 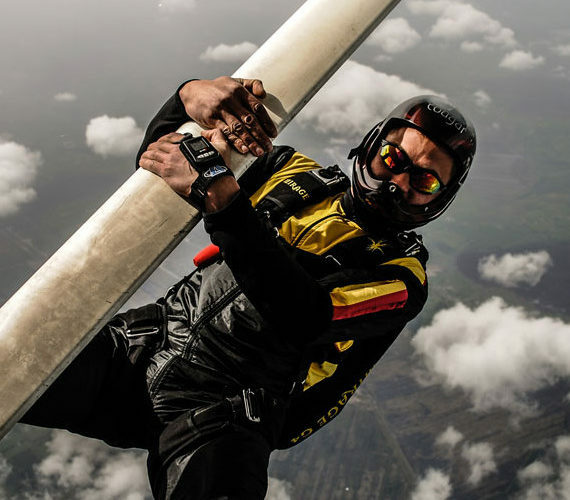 Two instructors will take you on your three levels to 13,000 feet. On exiting the aircraft they hold onto you in free fall giving you hand signals based on their assessment of your body position. Assisted Free Fall ‘AFF’ Level 2 To 3. You are assigned objectives on each level. 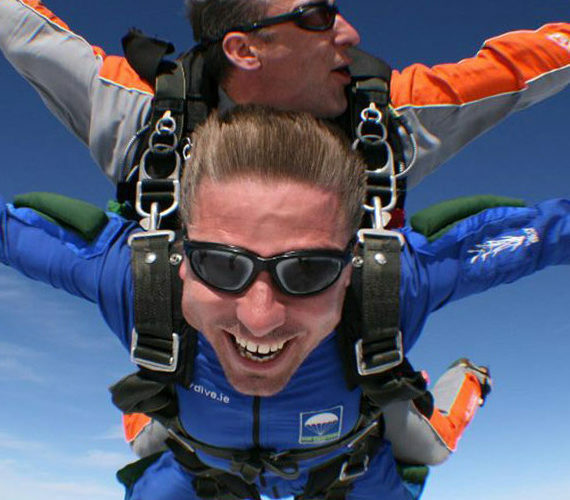 Two instructors will take you on your three levels to 13,000 feet. On exiting the aircraft they hold onto you in free fall giving you hand signals based on their assessment of your body position. Assisted Free Fall ‘AFF’ Level 4 To 7. You are assigned objectives on each level. 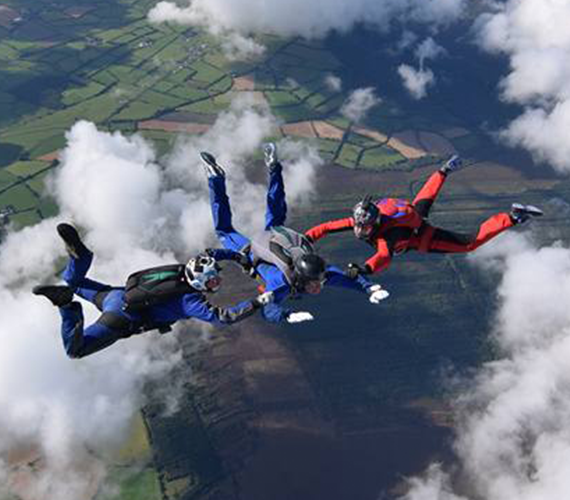 Two instructors will take you on your three levels to 13,000 feet. On exiting the aircraft they hold onto you in free fall giving you hand signals based on their assessment of your body position. You first need to have written permission to fundraise from the charity you wish to raise money for. The names of all the people participating must be on this letter. Once you have the permission, either fax a copy to ‘045-258571’ or post to the Irish Parachute Club, Clonbullogue Airfield, Edenderry, Co. Offaly. We will then send you sponsor cards, information leaflets and posters. 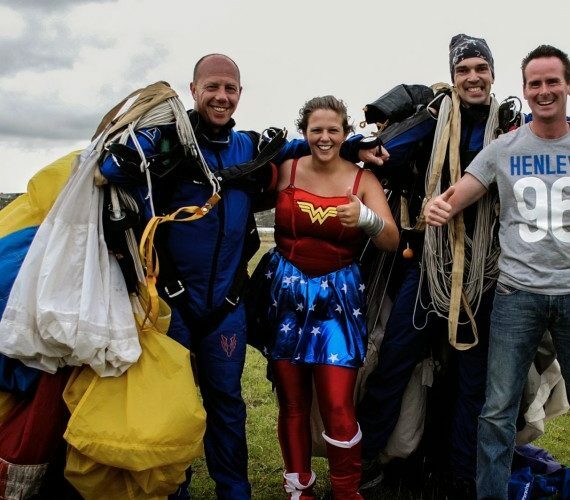 The parachute club offers a reduced cost of €260.00 each for charity jump which would normally cost ‘€320.00’ each and we request the you raise the same amount for the charity of your choice. For example the total amount to be raised should be at least €520.00 per person. All money raised goes to your charity. Once the fundraising is complete, please call ‘1850-260-260’ to book a date and to arrange the payment of the €260.00 per person.